An Open House is being held this Saturday, June 20 from 3 -7 pm at Edison Bible Church in Edison to celebrate the marriage of Cindy and Andrew Strauss. 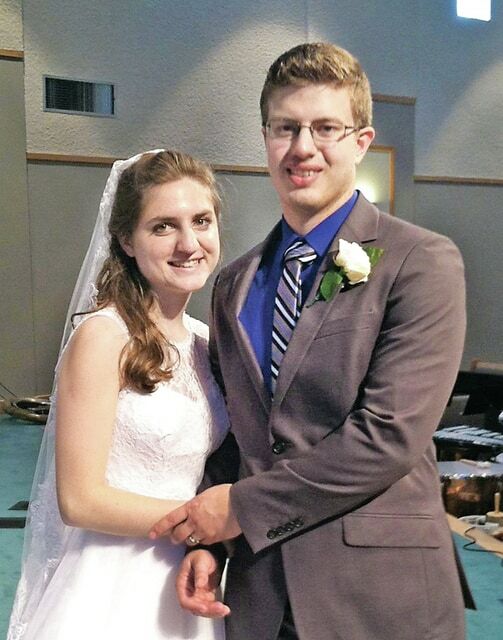 The former Cindy Goodman and Andrew Strauss were married June 6, 2015 at the Calvary Baptist Church in Hanover, PA in a ceremony officiated by Rev. Mike Osladil and Tim Welcher. Cindy is the daughter of Les and Tammy Goodman of Mt. Gilead. She is a 2012 graduate of Northmor High School and received a Bible Certificate in 2013 from the Word of Life Bible Institute. Andrew is the son of David and Jennifer Strauss of Spring Grove, PA. He was home schooled and graduated in 2011 and received a Bible Certificate from the Word of Life Bible Institute in 2013. He is employed by H & F Tire and is taking classes at Liberty University. The bride carried white roses at the afternoon ceremony that had royal blue and silver as its theme colors. Bridal attendants in royal blue gowns were Chelsea Spinelli, Rachel Cross, Eliana Burrella and Kamille Davis. Maid of Honor was the bride’s friend, Megan Church, of Delaware, OH. Flower girl was Laura Martin, friend of the bride, of Wooster, OH. Zaden Strauss of York, PA, nephew of the groom, served as ring bearer. Ushers and groomsmen were Ben Hartsfield, Brad Averill, Frank Lockerman and Steven Strauss. Best man was Daniel Strauss, brother of the groom, of Spring Grove, PA.
Soloist for the ceremony was the bride’s brother, Ronny Goodman, of Mt. Gilead, OH. The guest book was attended by Kristy Goodman, sister of the bride. The bride was given in marriage by her father, Les Goodman. After a honeymoon in Maryland, the couple are residing in Hanover, Pa.
Edison Baptist Church is located at 140 E. High Street, Edison, OH.